On September 1, 2017, Syfy renewed the series for a fourth and fifth season, each to comprise 10 episodes. The fourth season premiered on July 20, 2018, and concluded on September 21, 2018. The fifth and final season is set to premiere in 2019. Killjoys follows a trio of hard-living bounty hunters – Dutch, John, and D'avin. Working for the Reclamation Apprehension Coalition (RAC), they work in a four planet-and-moon system known as the Quad. Taking on warrants to apprehend people or property, RAC Agents are given high authority by their agency. As part of their job, they swear to remain neutral in conflicts and owe no allegiance to any system, government, or other organizations. With their pasts coming back to haunt them, the trio will have to work hard to keep themselves, and their friends, alive. The main cast for the series. 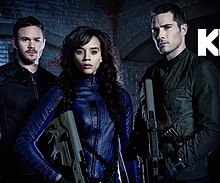 From left to right: Aaron Ashmore, Hannah John-Kamen and Luke Macfarlane. Hannah John-Kamen as Yalena "Dutch" Yardeen, a level five RAC agent with a secret history who was raised by RAC officer Khlyen. Aaron Ashmore as John Andras "Johnny" Jaqobis, a level three (later five) RAC agent. Dutch's RAC partner of six years and her best friend, he handles the technical aspects of their missions. Luke Macfarlane as D'avin Jaqobis, Johnny's older brother, a former soldier and indentured fighter who becomes a RAC bounty hunter to join and help his brother and Dutch. On September 1, 2015, Syfy announced it would renew Killjoys for a second season of 10 episodes. Bill McGoldrick, Syfy's executive VP of original content was quoted as saying "With exciting space-based action, deep world building, and a standout cast, Killjoys has struck a nerve with viewers and critics alike. We can't wait to see what adventures Michelle Lovretta and Temple Street take Dutch, John and D'avin on in season two." David Fortier and Ivan Schneeberg, the executive producers of the show, were quoted as saying "We couldn't be more excited to bring back Killjoys and its stellar cast to audiences across the U.S. We look forward to working with the team at Syfy for a thrilling second season." Starting with Season 4, Adam Barken became the showrunner of the series, with Michelle Lovretta remaining with the production as an executive producer and writer. Killjoys premiered June 19, 2015, in both Canada and the United States, and episodes air simultaneously on the two channels each Friday. It premiered in UK on January 25, 2016 and in Australia on January 30, 2016. On July 31, 2018, Ellation announced that seasons 1 through 3 would stream exclusively on its VRV subscription service. The first episode of the series received 286,000 overnight viewers in Canada. Charlie Jane Anders of io9 gave the show a very positive rating saying, "If wanting to watch fun, quippy characters get into scrapes and survive by the skin of their teeth, on spaceships and alien planets, is wrong, I don't want to be right. Killjoys has just the right mix of guns, high-tech knives, assassins, cage fights, missions to hostile planets, dark secrets, tiny robot weapons and general space headbutting thrills to be the perfect treat for Friday nights." Noting others' negative reviews, she went on to state "[w]e don't need every television show to be True Detective or even Battlestar Galactica." Writing for Forbes.com, Merrill Barr gave the first four episodes of the show an average to negative rating in a review titled "Sci-Fi Fun With Nothing Else To Offer", opining that though enjoyable for sci-fi fans, it featured "sci-fi archetypes that aren't bringing anything new to the table", an "overly complicated" fictional universe, and was "extremely light on depth and character intrigue". Rotten Tomatoes gave Season 1 a score of 80% based on reviews from 15 critics. ^ Vlessing, Etan (October 7, 2013). "MIPCOM: Canada's Space Orders 'Killjoys' From 'Orphan Black' Producer (Exclusive)". The Hollywood Reporter. Retrieved April 19, 2015. ^ Vlessing, Etan (April 30, 2014). "Syfy to Co-Produce 'Killjoys' Drama With Canada's Space". The Hollywood Reporter. Retrieved April 19, 2015. ^ "Official website". Syfy. Retrieved April 7, 2015. ^ Petski, Denise (September 1, 2017). "'Killjoys' To End Run With Two-Season Final Renewal By Syfy". Deadline Hollywood. Retrieved September 1, 2017. ^ Pedersen, Erik (May 10, 2018). "Syfy Sets Summer Premiere Dates For 'Wynonna Earp', 'Killjoys' & Final 'Sharknado'". Deadline Hollywood. Retrieved May 11, 2018. ^ Liptak, Andrew (June 30, 2017). "Syfy's space opera Killjoys returns tonight — here's why you should watch". The Verge. Vox Media. Retrieved January 3, 2018. ^ Castleman, Tocarra (September 1, 2015). "Good News! Killjoys Season 2 Will Premiere in 2016". Syfy. Retrieved September 2, 2015. ^ Sechere, Ama (February 1, 2018). "Original Series KILLJOYS Starts Production on Season 4" (Press release). Bell Media. Retrieved September 17, 2018. ^ Heather M (July 13, 2018). "Showrunner Adam Barken Sets the Stage for Killjoys Season 4 [Exclusive]". TV Goodness. Retrieved September 17, 2018. ^ David, Greg (July 19, 2018). "Killjoys: Showrunner Adam Barken discusses Season 4". TV, eh?. Retrieved September 17, 2018. ^ Cox, Jennifer (May 14, 2015). "Space Original Series Killjoys Premieres June 19th". CraveOnline.com. Evolve Media, LLC. Retrieved June 30, 2015. ^ Purcell, Charles (January 21, 2016). "New This Week (Jan 25): War & Peace, Suits, Black Sails, Bear Grylls and live sport". The Green Room. Archived from the original on January 21, 2016. Retrieved January 22, 2016. ^ Spangler, Todd (July 31, 2018). "First Three Seasons of Syfy's 'Killjoys' Streaming on VRV Under New Pact (EXCLUSIVE)". Variety. Retrieved August 7, 2018. ^ "Space Original Series KILLJOYS Seizes the Day as 286,000 Overnight Viewers Makes it the #1". PR Newswire. June 22, 2015. Retrieved June 24, 2015. ^ Anders, Charlie Jane (June 19, 2015). "Killjoys Really Is A Most Excellent Space Adventure Show". io9. Retrieved July 6, 2015. ^ Barr, Merrill (June 15, 2015). "'Killjoys' Review: Sci-Fi Fun With Nothing Else To Offer". Forbes. Retrieved July 7, 2015. ^ "Best Sci-Fi Series – IGN's Best of 2015 – IGN". IGN. Retrieved July 4, 2017. ^ a b "Awards database". academy.ca. Retrieved May 18, 2017. ^ Publications, Locus. "Locus Online News » 2016 Aurora Awards Winners". www.locusmag.com. Retrieved May 18, 2017. ^ "2017 Aurora Award Ballot" (PDF). prixaurorawards.ca. Retrieved May 30, 2017. ^ Tech, Simon. "Nominees – Young Artist Awards". www.youngartistawards.org. Retrieved May 18, 2017. ^ "2018 Nominee List | Aurora Awards". prixaurorawards.ca. Retrieved July 26, 2018. Dowling, Amber (June 19, 2015). "'Killjoys' Creator on Avoiding Love Triangles, 'Aliens' Influence". The Hollywood Reporter. Faulkner, Rod T (July 20, 2017). "Science Fiction & The Disabled: How The TV Series 'Killjoys' Has Broken New Ground". Medium. Liszewski, Bridget (March 2, 2016). "Women Behind Canadian TV: Michelle Lovretta". The TV Junkies. Liszewski, Bridget (August 30, 2016). "Killjoys Puts A High Priority On Diversity". The TV Junkies. O'Neil, Shana (August 26, 2017). "Michelle Lovretta on Killjoys, swear words, and to the war to come". Syfy Wire. This page was last edited on 28 March 2019, at 02:01 (UTC).